The undeniable social and ecological challenges of the present and future require different skills and attitudes than those that created them. For a resilient future, we must empower children to understand and apply more holistic practices within all dimensions of sustainability. This can be achieved through participatory communities and child-centered learning, ideally both. It’s clear that holistic living is powered by holistic learning. With this philosophy, the CiP project developed an educational framework to empower children to live in better harmony with the natural world and each other based on permaculture ethics and principles. Over three years, the European consortium analysed a variety of education resources and published their findings in a CiP Manual, launched at the conference in Prague. 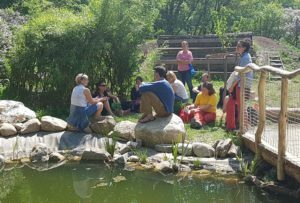 Joined by about 100 practitioners, educators, and parents from almost 20 countries, they expanded the network and explored next steps. This September, they released a short film showcasing the project motivations and highlights from the conference, which can be viewed here. 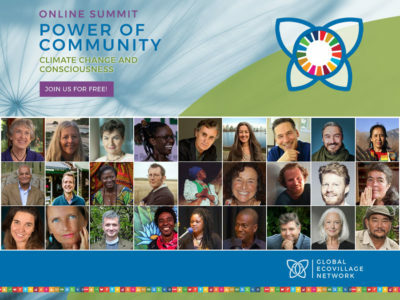 Participants of all ages came from ecovillages, off-grid community projects, and cities. In the spirit of co-creation, they presented their motivations, challenges and how they’re reaching their shared goal of living in abundance, inviting ideas and collaboration with this new community. For example, in Greece, the Permaculture Learning and Upcycling Campus for Kids (PLUCK) places youth at the centre of the community. By applying the “contributionism” concept, every community member – including youth – adds value to the project and benefits from a share of the outputs. This allows the project to grow and maintain resilience while serving the needs for learning through collaboration. By developing creative projects, young people identify and meet the needs of the bioregion as well as their own. They proudly provide services that most Greek families need (from food to capacity building) to attract the wider community and empower new possibilities. A family from Land Matters in the UK showed parts of their off-grid life and earth-based education perspective. The small group of children there learn through lots of play, some structured learning, and supported hands-on activities. Acknowledging that learning is natural and constant, their approach respects that children learn through experimentation and decision making. A young boy told of his role of collecting water, demonstrating his appreciation for the responsibility given to him. Nurturing this sense of ownership allows each young individual to explore how their own skills and perspective fit into the whole. Some Czech students presented how permaculture has also worked in their school, where they’ve designed and installed gardens and built an outdoor classroom together. They shared stories of how they discovered their joy for learning when they could participate in projects that were relevant to real life. (GEN collaborates on similar projects in schools in Zambia, Zimbabwe, and Ghana through the Greenings Schools Initiative.) Developing both their communication skills as well as building abilities, they engaged their families and neighbours to come together to serve their shared goals, both short- and long-term. This theme echoed throughout each presentation: when you want to build a project, first build community. 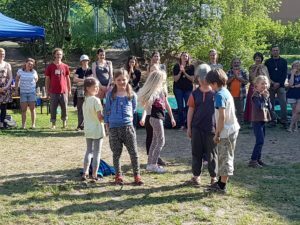 Just as permaculture is not learning about nature, but learning from it, the CiP pedagogy emphasises how to practice permaculture with children, rather than what to do (though it does also give many ideas for inspiration and implementation). 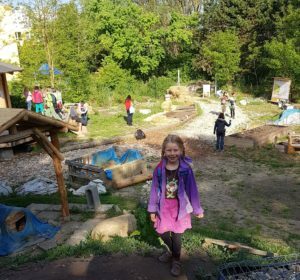 It is not about teaching permaculture in a kid-friendly training, but instead about embedding permaculture principles and practices into diverse forms of learning. After the success of the first conference, the 2019 conference will take place in London over two days: the first of which will be incorporated into the London Permaculture Festival on July 7th, and the second will take place in Cecil Sharpe House on the 8th. The conference is aimed at educators of children aged 3-12 years. In this context, the term ‘educator’ refers to anyone who is involved in the education of a child including school, nursery and kindergarten teachers, parents, Forest School leaders, Woodcraft Folk leaders, Scout leaders, grandparents, foster parents, aunts, uncles and many more. Anyone interested in learning more about the partners, accessing the range of research, free resources and manual is invited to visit the Children in Permaculture website, and follow them on Facebook and Instagram. As the project evolves and forms the next phase, the team is open to new collaborations. Mostly, they hope that many will be inspired to engage with children in a way that recognised they are part of the solution for our uncertain future. When we allow them to design their own learning through direct experiences in nature, children become empowered, resilient, co-creators of a better world. A World Citizen for Sustainability & Regeneration, specialising in Education, Communications, & Project Management.